The diagnosis of a chronic or life-threatening illness brings anxiety. It throws the individual and their family into a world of the unknown. It pokes and prods us to become vigilant in our search for hope. The hope is that there will be a treatment protocol that will cure or at least alleviate suffering. As I’ve discussed in the past, there is a difference between getting better and getting well. Cure is the hope, but it’s not always possible. So what is possible? I’m always on the lookout for news about new treatments. I feel like an information and referral resource for friends and family. It’s a role I enjoy. I’m honored that people in my life trust me enough to share their experiences. My ears and eyes are always open for some information that I can pass on to ease the illness experience. How vigilant am I in my search for hope and healing? I was watching Jeopardy last night and across the bottom of the screen there was message that said, “FDA approves new medication for MRSA (Methicillin-resistant Staphylococcus aureus). That sent me directly to the computer to see what the news flash was about. If you’ve been reading my posts you know my dog has been living with MRSA for the past 6+ years. I need hope. Our lives have revolved around a cycle of diagnosis and treatment. After a while you feel like a hamster on a hamster wheel. The cycle is repetitive and each time a culture gets sent to the lab we hope and pray that there will be some medication that will tame the infection. As you know if you’ve been diagnosed with a chronic or life-threatening illness, there’s no guarantee that treatments will work forever. We hope that someone in research and development will bring forth a new strategy while we still have time. Hope also requires that we invite others into our lives. We can’t be everywhere and know all. Inviting others into your life, like others have invited me, giving you a personal research team always on the lookout for an interview, news article, or like yesterday, a message crossing the television screen. Hope isn’t only about faith. There’s a practical side to hope based on technology, research, and organizations that lobby for money to bring forth new treatments. Whether the future holds a space for you where you get well or get better, remember that hope is a strategy. It needs to be part of your treatment regimen! 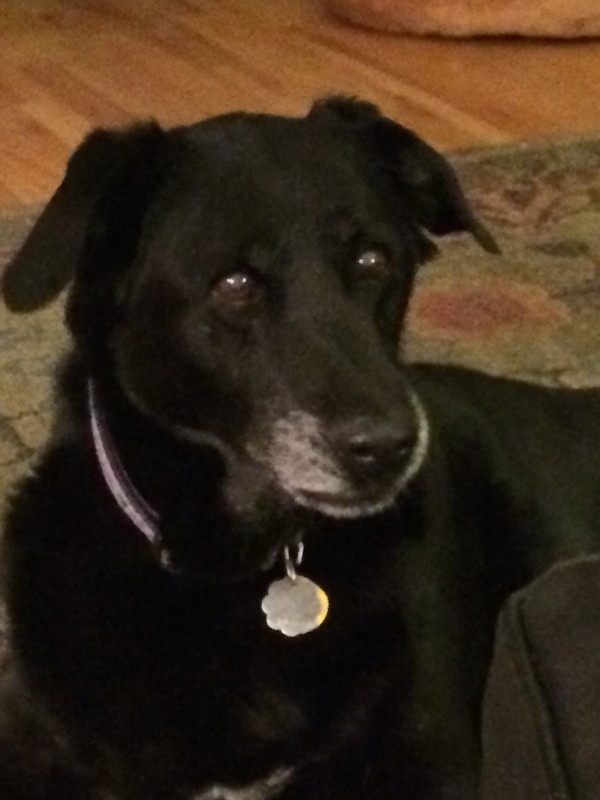 If you’ve read some of my past posts you know that I have a black lab mix named Tashi. She’s thirteen plus and has been fighting MRSA (Methicillin-resistant Staphylococcus aureus) for seven years. The past ten months have been one infection after another. The bacteria are sneaky, mutating every six to eight weeks requiring a new culture and new meds. She’s been so patient! In addition to medication, she gets a laser treatment on her foot every other day. It’s a great experience for her because the treatment is painless and she gets lots of treats from the entire staff at the vet. So why am I feeling helpless in this moment? This past weekend she developed conjunctivitis. She had a discharge that was making her continually rub her eyes. We took her to the vet and he prescribed medication. Yesterday I woke up and noticed that instead of progress, her eyes looked worse. They were so bad that she could hardly keep her eyes open. Her regular doctor was off yesterday so she got to meet a new vet (new for her). The doctor was kind and considerate. She knew about Tashi’s history because she’s been teaching the entire staff about MRSA and all the troubles that come with this diagnosis. New meds, eye drops to soothe the itch, and lots of love will hopefully make the difference. Helpless because I can’t make her feel any better. She can’t rub her eyes so she has to wear a cone (the famous radar dish) so she won’t irritate her eyes. I’m putting ointments and drops in her eyes every couple of hours. I feel helpless because in trying to make her feel better I have to do everything in my power to prevent her from irritating her eyes even further. I feel helpless because being so vigilant with the MRSA that a different infection leaves me feeling defeated. I feel helpless because I can’t explain what’s going on to her, and all she can do is trust that I’m going to help. Helplessness is very uncomfortable. A different kind of uncomfortable than the itch and pain she’s experiencing because it’s my soul is uncomfortable. This type of experience teaches me that I can only do what’s humanly possible. I can only be compassionate and proactive about her medical condition, but I don’t have the power to heal her. Uncomfortable because it shows that I have limitations and surrender is my only option. Our story continues. She’s a happy girl, although uncomfortable in this moment. She’s full of love. She holds spaces of trust and love in her heart (so maybe I’m projecting a bit). We’re a team! There isn’t anything I wouldn’t do to ease her pain and discomfort. There isn’t anything I would do that would jeopardize her quality of life. There is only one thing I do have power over, ensuring that she leaves it all on the table, living a life that’s full of love, fun, and connection. You’re going to think I’m a bit strange because the story I’m going to share is about my dog. Believe it or not, my dog Tashi has had more medical problems than most of us will have in our own human lives. It all started about five or six years ago when she acquired Methicillin-resistant Staphylococcus aureus (MRSA). I don’t know how she acquired this infection, but it has been recurring relentlessly over the years. Unfortunately MRSA isn’t curable, it becomes a chronic, potentially life-threatening condition. The incident this past week started last Wednesday when Tashi awoke limping. Her back foot (location of the MRSA wound) was swollen. She ate breakfast and took her place in the family room and didn’t move for seven hours. We decided to take her to the emergency vet that evening because she wasn’t engaging in normal activities and she couldn’t get up off the floor on her own. The vet we saw, a young vet, was quite personable and very good with Tashi. He did a thorough exam and was respectful of her pain limits. The thing that caught my attention was his personal shock at how swollen her foot and leg had become. He was perplexed hoping that maybe she had an issue with a bone or joint. Because of the MRSA he had to be very careful about any biopsy or culture because he didn’t want to spread the MRSA if in fact it was present. The radiograph didn’t show any abnormalities, a huge relief. He did perform a culture of the wound on her foot, non-invasive. He also prescribed a very strong antibiotic and pain medication. We took her home with the hope that she would begin the healing process. Unfortunately as Thursday progressed, her leg became more swollen and this was worrisome. The next step was to take her to her regular vet. One more appointment and when he saw her foot he was also a bit perplexed and concerned. She wasn’t putting pressure on her foot and the leg was swollen up to her hip. He prescribed a second antibiotic and now we wait for the culture results. The sad part is that animals can’t tell us other than behavior about their physical problems. I feel fortunate to have medical professionals that are engaged in her well-being and take measures to create increased odds at healing the infection. I didn’t know that the field of veterinary medicine doesn’t have a specialization in infectious disease. The specialty seems to be on the horizon, but until that happens either a general practitioner, or in Tashi’s case her dermatologist/allergy doctor have to serve as our medical resource. How does this translate into the experience of humans? We don’t always have an answer for symptoms that arise from an illness. It’s important to feel comfortable going to a specialist if you don’t feel that your illness/symptoms are getting better. In addition, I felt it important for her regular physician to see her because he knows her history and her body. He understands her response to past medications and infections. He knows her temperament and tuned into her response when he exams her. These are important because her history may have clues to heal the current medical dilemma. Things are still uncertain and the fact that she’s over twelve years old doesn’t soothe my anxiety. I can see the desire in her eyes to get better (my personal projection) but I’m hoping we make it through this health crisis. I hope you maintain that fire in your soul to get better or well. I have two dogs and both have had their fair share of medical issues. I’ve talked much more about my black lab Tashi who has suffered with recurrent infections due to MRSA. I’ve learned a lot about facing illness and creating a new normal from her. This past weekend my other dog, Bella, visited the vet because of a cyst in her ear. As it turns out, Bella has a hematoma in her ear. It was drained and a cortisone injection to reduce the swelling was administered. During the examination the doctor noticed Bella required dental work with the probability that a tooth would need to be pulled. If that weren’t enough, she has a cyst in the middle of her head that we decided is she’s going to be under anesthesia should probably be removed. Bella was sent home with a bandage covering her ear. Unfortunately, she kept trying to remove it so we had to get one of those big radar dishes for her head. The poor thing was bumping into walls, tripping over things, and was generally a bit disoriented. This morning I took Bella to the bet for her procedure. She was very good in the exam room, probably because she was scared. She began to shiver. Her anxiety was evident and trying to console her did little good. The vet was very good with her and he too tried to console her. So why am I talking about a 10-1/2 year old dog? Because dogs don’t understand their pain, the medical procedures they endure, or adjusting to medical devices for their own protection. On the other hand, as humans we also don’t understand pain, medical procedures, or medical devices that become part of our every day lives. Too many of us try and make sense of our illnesses, but is that even possible? When we enter the medical arena we often try and hide our fear and anxiety, but it still always comes through. Because illness is so disorienting how do we try and alleviate the panic? It’s important to have people in your life that will help you disperse the anxious energy. Talking, engaging in creative activities, finding a spiritual director, illness coach, or psychotherapist helps with those anxious moments. What would happen if you really experienced the anxiety so you could disperse it into the universe? We expend so much energy trying to hide it or suppress it that we are continually exhausted physically, emotionally, and spiritually. I had a clinical supervisor who said, “You can’t get out of something if you’re never in it”. It’s like dancing around the mouth of the volcano…sometimes you have to jump in so you can know what you’re getting out of, experientially. My dogs are my examples for coping with illness. They seem fearless, truly a projection. They provide me with insights into the illness experience that I wouldn’t have made conscious any other way. It is because of that, that I am eternally grateful and I make sure any way I can be of service to them I will.